So anyways, I did not take a picture of my nails from last week. They were gold with a blue glitter on top (my school’s colors), fairly simple compared to some designs for me but really unimpressive too since they started chipping day 2. This week I decided to try a color that was given to me by my 8 year old sister-in-law. It is very shiny and bright. Its not really my style, but I’ve done them 3 times in 24 hours and they will stay as they are for this week. Any recommendations for next week’s nail design? 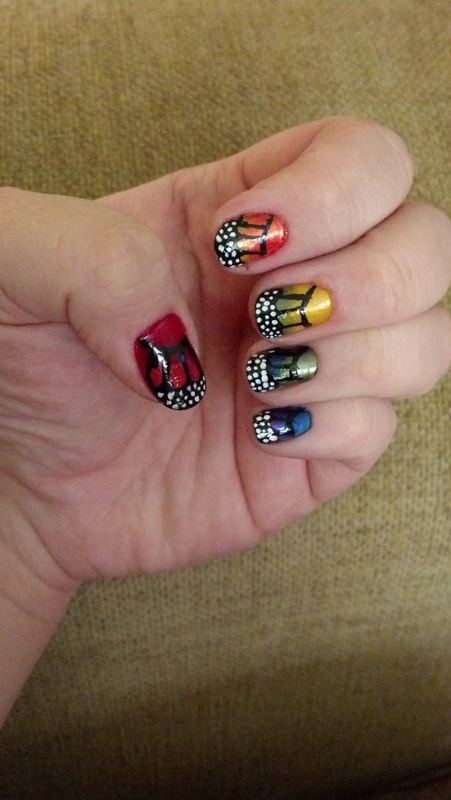 I wanted to share some nail art I did about 6 months ago, some that I’m fairly proud of. This was something I found on pinterest and wanted to replicate. They were in honor of my best friend’s birthday. Back when I was in high school he died at 14 from a heart attack. He had an irregular heart beat and had just come out of a routine surgery. It was devastating. I was 16. At his funeral, his mother tells the story that she was just asking for a sign from God and he sent this orange Monarch butterfly that wouldn’t leave her alone. I remember being there that day and seeing the butterfly flutter aroundall the people, especially his mother. Ever since then I have always associated butterflies with his spirit. So I did my nails like that for the week of his birthday. I miss him everyday.